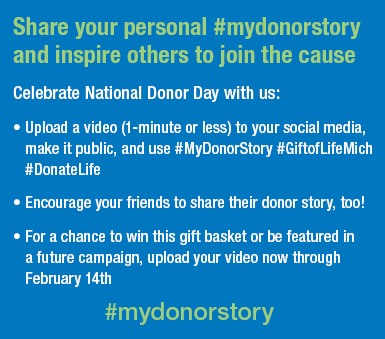 In honor of National Donor Day (February 14) Gift of Life is launching a social media campaign called "My Donor Story." 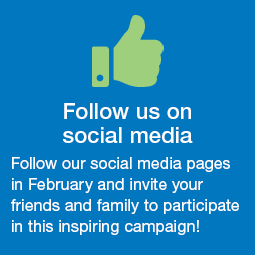 From February 1-14, we invite you to post on your Facebook, Instagram, or Twitter pages a video story (1-minute or less) that highlights the impact of donation and transplantation in your life. 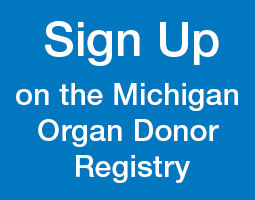 My Donor Story is a Gift of Life Michigan social media campaign that shows the impact of organ donation on the lives of real people. You can participate in this inspiring campaign by recording and posting a short video (1-minute or less) on your social media pages, sharing your experience with organ, tissue or eye donation. Explain how donation has influenced your life or the lives of your loved ones and emphasize the importance of being a donor. 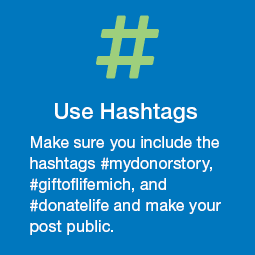 From February 1-14, post your video or story on Facebook, Instagram, or Twitter and use the hashtags #mydonorstory, #giftoflifemich, and #donatelife. Remember to make your post public so we can see your video! 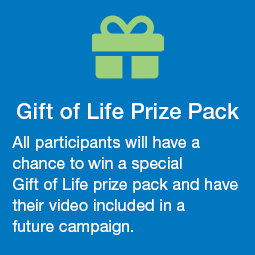 You will have a chance to win a Gift of Life prize pack, and also have your video included in a future campaign. Share your story and help us celebrate National Donor Day!